Up until its final stages, the Iranian Revolution never intended to install an Islamist theocracy. Although that was the ultimate outcome, it came about only after the movement to overthrow Shah Mohammed Reza Pahlavi was co-opted by Ayatollah Ruhollah Khomeini — who returned from exile 40 years ago on Monday — after the revolution had already been successful in achieving its primary aim. By that time, Iran’s monarchy had already killed or effectively silenced all of the people who had remained in the country to play a leading role in the people’s effort to throw off the shackles of dictatorship. It was not because of ideology but because of perceived necessity and a relative lack of options that the architects of a new government then coalesced around Khomeini. By the time anyone knew what was happening, it was too late to halt the momentum of the ayatollah’s push for his system of Wilayat Al-Faqih, or absolute rule by Shiite clerics. 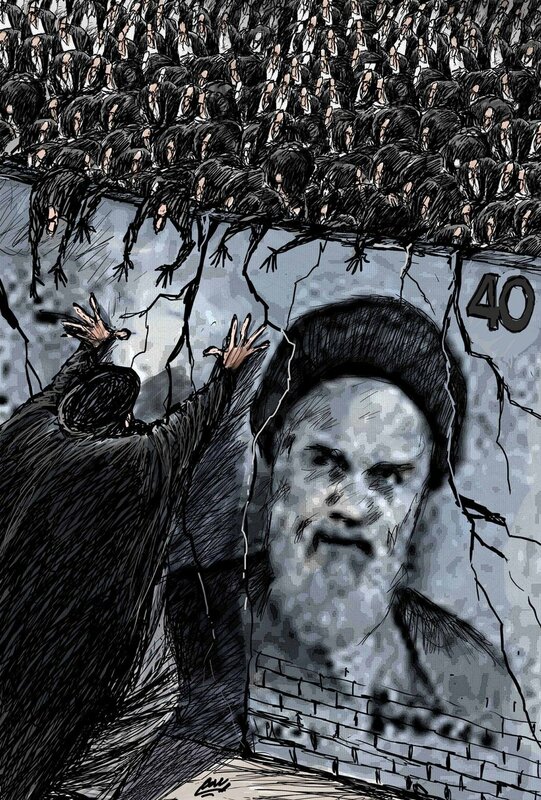 It seems that the legacy of that revolutionary resistance will not be complete until Iranian citizens bring about the collapse of the theocratic regime that was established by Khomeini in defiance of the overriding national will. It is an outcome that has been 40 years in the making but, depending in part on the actions of the international community, it is an outcome that may be close at hand. The entire year of 2018 was defined by anti-government protests throughout the Islamic Republic, which began with a demonstration against economic decline in the city of Mashhad in the final days of 2017. Within two weeks, the initial protest had spread to upwards of 100 cities and towns, where participants chanted provocative slogans like “Death to the dictator” and “Death to Rouhani.” These refer, respectively, to Khomeini’s heir as supreme leader, Ali Khamenei, and to the elected president, Hassan Rouhani, an alleged reformist whose “moderate” agenda has failed to bring about any meaningful change over the past six years. The revolution fell short of its long-term goal of ridding the country of subjugation and repression, full stop. With the moderate and hard-line factions of Iranian politics apparently working hand-in-hand to maintain the status quo, more and more Iranians are publicly endorsing the notion that their welfare and future prospects will be served only by removing the Shiite religious dictatorship from power. Last year’s nationwide uprising and various subsequent protests have therefore pushed both of the mainstream political factions to declare: “The game is over.” Predictably, the clerical regime is responding in much the same way as the shah did to the proliferation of threats to his power. Thousands of Iranian activists have been arrested over the past year, and dozens have been either shot dead in the street or tortured to death in police custody. For some observers, this may be a source of concern about the future of the movement and resistance to change the theocracy. In other words, even if it proves successful, what is to stop Iran from ending up leaderless and thus giving way to co-option by yet another ruthless dictator? The answer lies in the fact that, contrary to what happened in 1979, many believe that there exists not only a viable alternative to Khomeini’s system but also an established opposition and leadership structure that stands ready to guide the Iranian nation through its transitional period. More to the point, that alternative is defined by well-articulated democratic ideals, leaving no doubt about a new revolution leading, finally, away from dictatorship and toward popular rule once and for all. Just as Khomeini did in Paris in 1979, many argue that the head of Iran’s organized opposition, the National Council of Resistance of Iran (NCRI), waits in exile for a triumphant return. In this case, however, it is believed that the pending leadership is something to be heralded by the international community, particularly by Western democracies, whose defining ideals of governance and civil freedoms are the same as those that are outlined in the NCRI’s 10-point plan for the country’s future. Many Western policymakers have already grown familiar with that plan and endorsed the platform of the Iranian opposition, as evidenced by their presence at the organization’s annual summer rally near Paris, which attracts tens of thousands of Iranian expatriates who hope to one day return to a country that has salvaged its original vision of popular revolution. In a nutshell, when policy-makers and politicians fully understand the prospect for a democratic Iran, which was only narrowly snatched away 40 years ago, they should see fit to finally direct their policies toward supporting the Iranian resistance and paving the way for regime change.